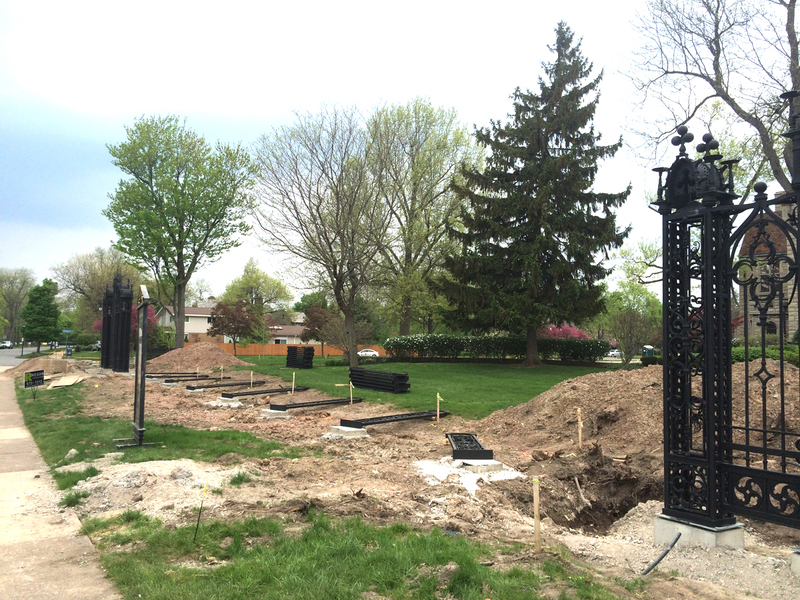 The historic Miller Mansion, located at the corner of Nottingham Terrace and Lincoln Parkway, is being outfitted with a serious set of gates and fencing. The former Nichols School (grade school), and stripper’s palace (owned by proprietor of then Nick’s Tally Ho) is now getting a Munsters-esque make-over. 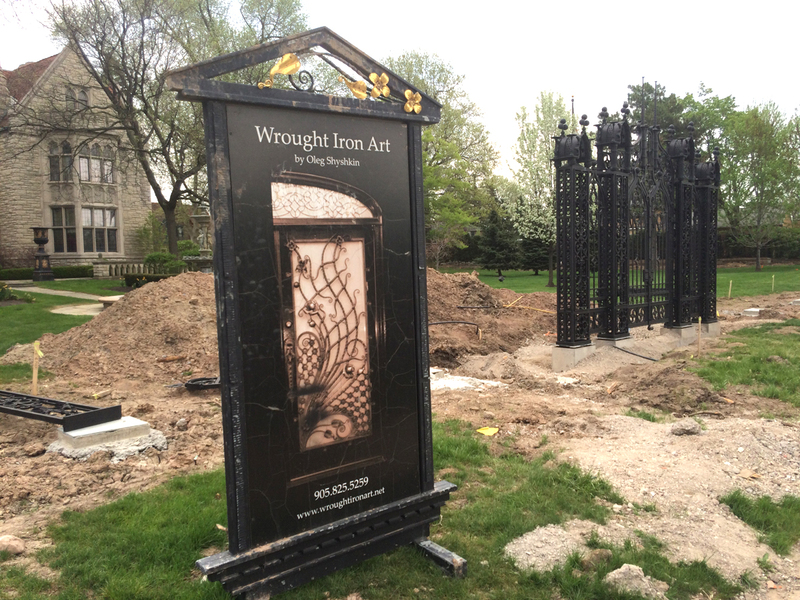 The mansion’s Canadian owners have retained the design and fabrication services of Oleg Shyshkin at Wrought Iron Art. The dramatic addition to the house is a real showstopper. The presence of the newly fashioned gates has been making the rounds on social media and has also attracted a host of gawkers on the street. 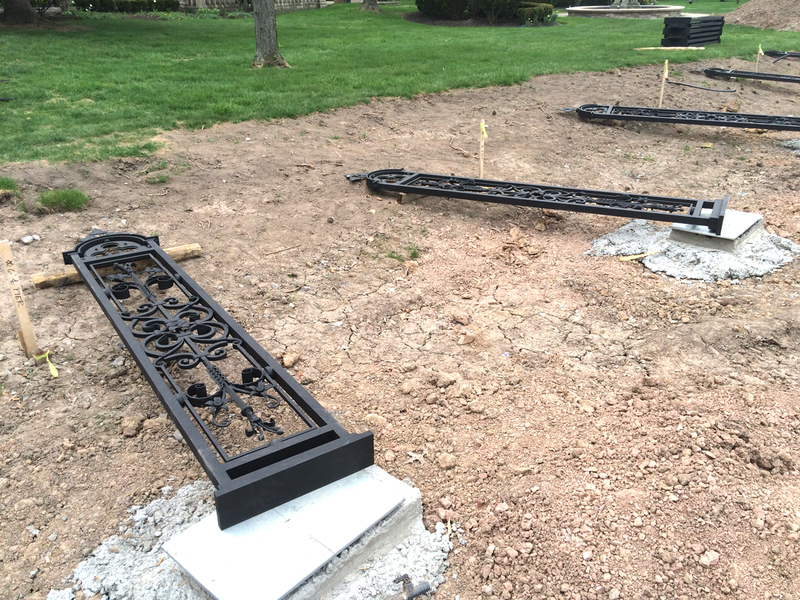 Already, two looming ornamental gated entranceways have been installed. Parts of the lower wrought iron fencing can be seen laying on the ground in-between the doorways ready for fashioning. If the mansion’s owners were looking to make a statement, they certainly succeeded in doing so… and then some! I see my Gates are very popular in Buffalo, NY. 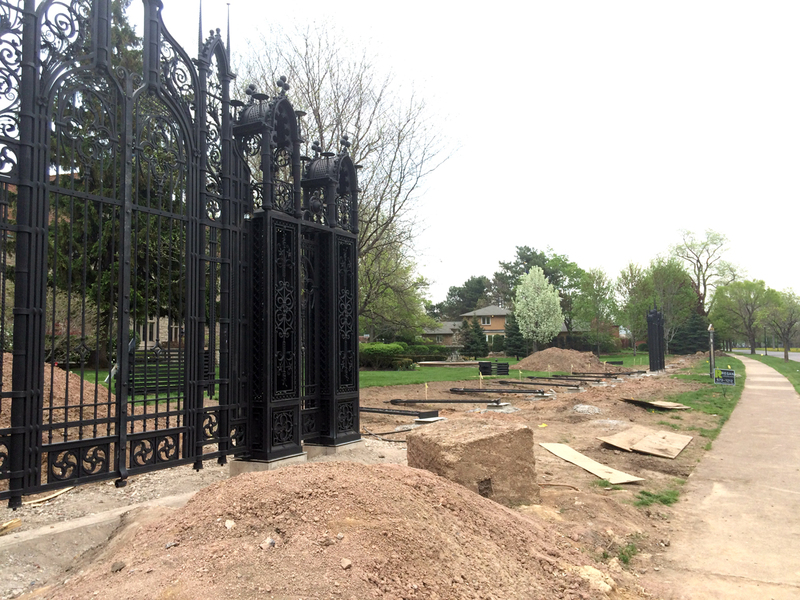 The gates installed recently in front of the mansion across from Delaware Park already are stopping traffic, even though the project is far from complete. 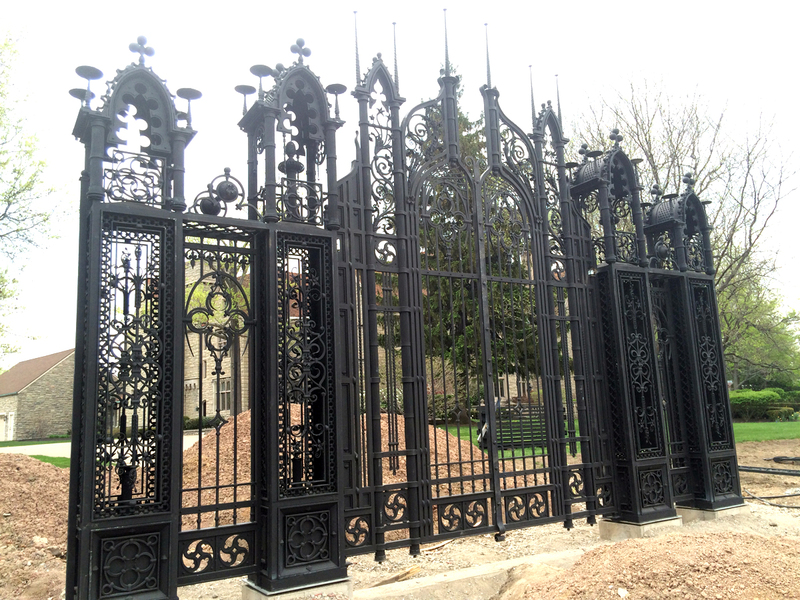 A crane last week hoisted two massive wrought iron gates into place in front of the 12,000-square-foot English manor at 175 Nottingham Terrace. They will be the centerpieces of a fence designed by a Ukrainian-born architect, living in Canada, whose artistic blacksmithing has garnered attention on both sides of the border. Ziccarelli has a friend who works for the concrete company that already has poured approximately four dozen of the 90 piers to anchor the gates and, eventually, an 8-foot fence enclosing the property. Stonework, antique lighting and plantings also are planned for the site, according to project manager Daniel Regan of Regan Landscape. “The fence is certainly a huge piece of what we’re doing,” he said. The project manager would not comment on the cost of the fencing project, but one source with knowledge of the project told The Buffalo News the price tag is approximately $800,000. 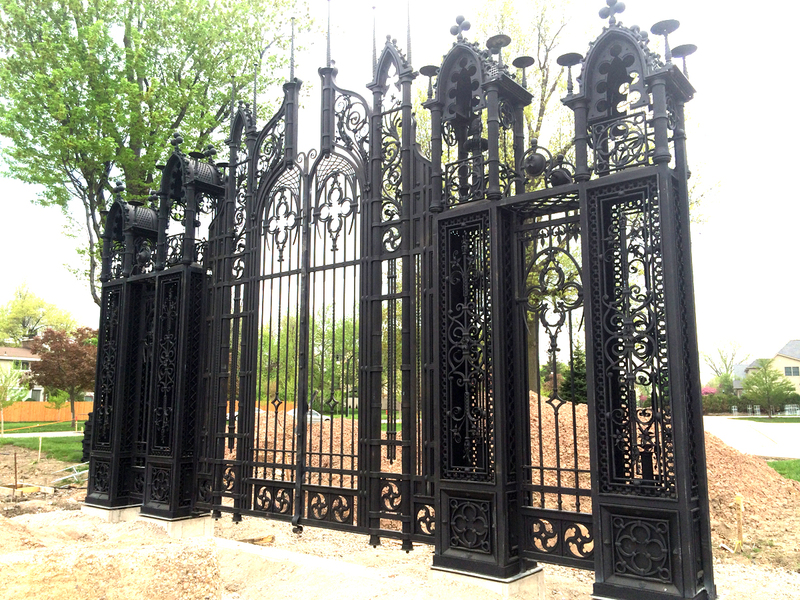 All eyes are on the gates; the western one is for the driveway and the eastern is for pedestrians. They were designed by Oleg Shyshkin, who opened a studio in Toronto almost two decades ago to design and forge artistic wrought iron. His company, Wrought Iron Art , also creates stairways, railings and balconies, and lights and chandeliers, among other things. Site work began last fall, said Regan, an owner of the family business that has been doing work at the mansion. Albert and Donna Haid of Burlington, Ont., bought the mansion for $1.7 million in 2010. He is the founder of Children’s Educational Funds Inc., an investment fund manager and promoter of The Children’s Education Trust of Canada. The Haids left the design up to Shyshkin. It’s new Gothic style, he said in a brief telephone interview Tuesday. Installation should be complete by the end of summer, Shyshkin said. A variance for the fence, which exceeds height limits in the City Code, was approved by Buffalo’s Zoning Board of Appeals in early 2014. At the time the application was presented, nearby residents believed the 8-foot fence would extend only along Nottingham Terrace and Lincoln Parkway, according to a neighbor who asked not to be identified. Middlesex Road is to the north and Randwood Lane to the east. When completed, the fence will run behind neighboring properties, which include the Middlesex Road home of former Buffalo Sabre Tyler Myers. “If we had known it would be along the back of our property, we would not have approved the 8-foot fence,” said the neighbor, who is concerned about damage to trees close to the property line. Still, the neighbor offered a glowing review of the project so far. The Haids are the latest owners of the property, which was farmland before the mansion was built between 1929 and 1933. Through the years, it served as a home, a convent and private school, and again a home. “They were not in the market to look,” said Bonnie Clement of Hunt Real Estate, who had the listing for the property. But Donna Haid had spotted the oversized sign on the property as she was driving by with her son, who attended Canisius College. “They called me on a Sunday and they wanted to see it right away,” Clement recalled. Donna Haid told her it was her favorite house in Buffalo. The site also had housed the Honduras building for the Pan-American Exposition in 1901, where President William McKinley was assinated. Donna Haid, who is a distant relative of McKinley, came across a painting of the president while touring the house with her husband. News Staff Reporter Joseph Popiolkowski contributed to this report.